I serve at our church's coffee hour on a rotational basis. In addition to pouring juice and making coffee, we provide the snacks for the hour. Snacks mostly come in the form of a baked good, like cookies, cupcakes, donuts, and quick breads. Sometimes there is cheese, crackers or fruit. This past Sunday was my turn. I baked and frosted some cookies, using a mix and canned frosting that I picked up on clearance late last winter (cookie mix was 42 cents, frosting 37 cents). The mix made 3 dozen cookies, exactly, and I needed another 2 dozen treats of some sort. I had thought I would swing by Cash & Carry early on Sunday and pick up a container of fresh strawberries to put out for the remainder of the my treats. I ran short on time and energy, and I really wanted to just use what I had on hand. In looking for something healthy in my fridge I found some red grapes and a large block of cheddar cheese. In about 15 minutes, I made 2 1/2 dozen mini-kebabs of cheese and grapes. 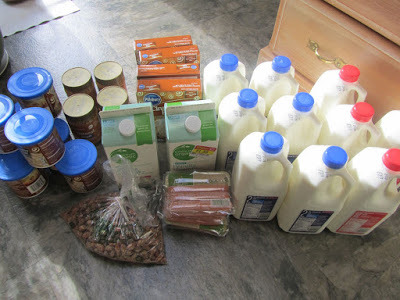 I saved time, energy and money by choosing to do these instead of buying strawberries. And they went over very well. Well, that looks delicious! I would choose the grapes/cheese any day over a cookie. Yum! There were quite a few people, though, who did choose these kebabs. I hope your day is off to a wonderful start, Alice! You are so clever! And those treats look luscious! Plus a diabetic could eat those easier than cookies. When we serve at church we try to have something like cheese or fruit. But pairing them looks so appealing. And I am blown away at how cheaply you made cookies. You are definitely impressive. As it turns out, there are a few people in our church who don't eat grains or gluten, and this treat worked for them. So I was very glad that I had it for them, especially. Last minute thing and they did work out well. Have a great day! Great idea and cute presentation! I loves grapes and cheese! Quick, snack-y lunches are my favorite for work. Grapes and cheese are frequently in my rotation. Sometimes I add crackers. Those marked down mixes and frostings have served you well! I'm going to watch for some of those after the holidays this year. I don't know if the flavor will be repeated, or if it was a one-time offering, but the mix and frosting was "Cinnamon Bun." The frosting has a hint of cinnamon and maple, and the cookies are like a snickerdoodle, but a bit more cinnamon-y. It does seem like a "seasonal" flavor, so may come back this fall, and is just odd enough that there would be leftovers that make it to markdown, after Thanksgiving/Christmas. I used the mixes on 4 occasions for coffee hours and got really good feedback every time. I always had 2 or 3 people asking me for the "recipe." If I see these mixes and frosting again, on markdown, I will definitely buy them. Your lunches for work sound delicious. I often do something similar, with cheese, nuts, fruit, peanut butter on toast, for either lunch or breakfast. Have a wonderful day, Angie! 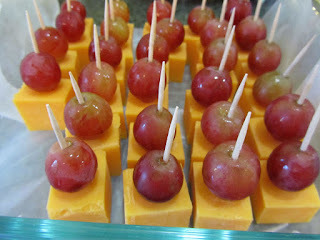 I sometimes do cheese cubes with toothpicks for snacks, but putting a grape with them is even better. I find that the cheese has to be just the right temperature when inserting the toothpick or it splits. Did you have that problem? you know, I was concerned the cheese might crack, but it didn't. I think drier cheeses that are aged longer would be more susceptible to cracking. I also think it helped that I cut the cubes into substantial pieces. I had the cheese on the counter for about 20 minutes before cutting. Maybe it did warm to just the right temp. I'm just guessing at why it didn't crack. I was quite grateful that it didn't. I just remembered. I put pretzel sticks in them. Those are big enough to cause a cracking problem unless the cheese is just right. Ooooo! LOVE the cheese and grape kabobs! They look so pretty too. I'll have to remember that one. Thanks, Cat. I like how simple they are, yet they look nice. I, too, think the cheese and grapes look wonderful! Great idea--I'll be storing that one away! Very easy and fast. The bonus is they used up the last of some red grapes. I'll likely do these again, if I have the right ingredients on hand.